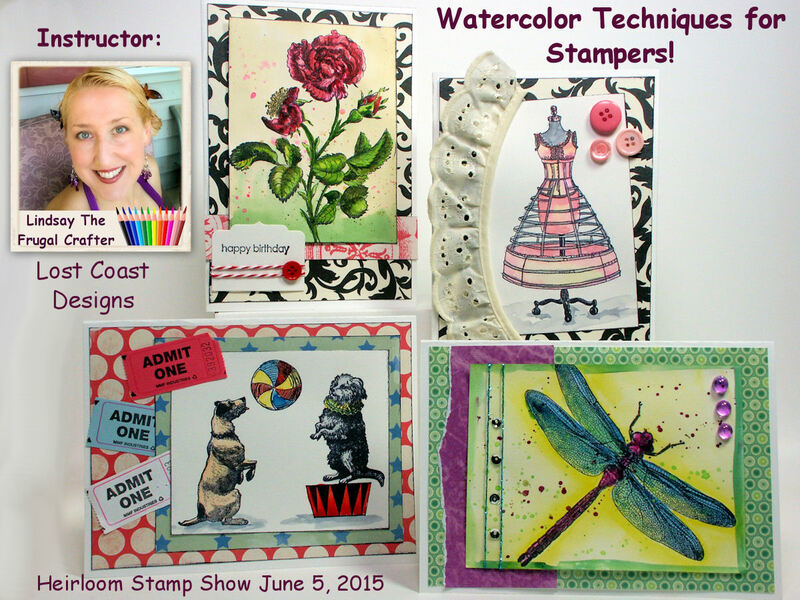 Watercolor Classes @ the W. Springfield Stamp Show & Ticket Giveaway! Hi friends! I have some fun news to share today! 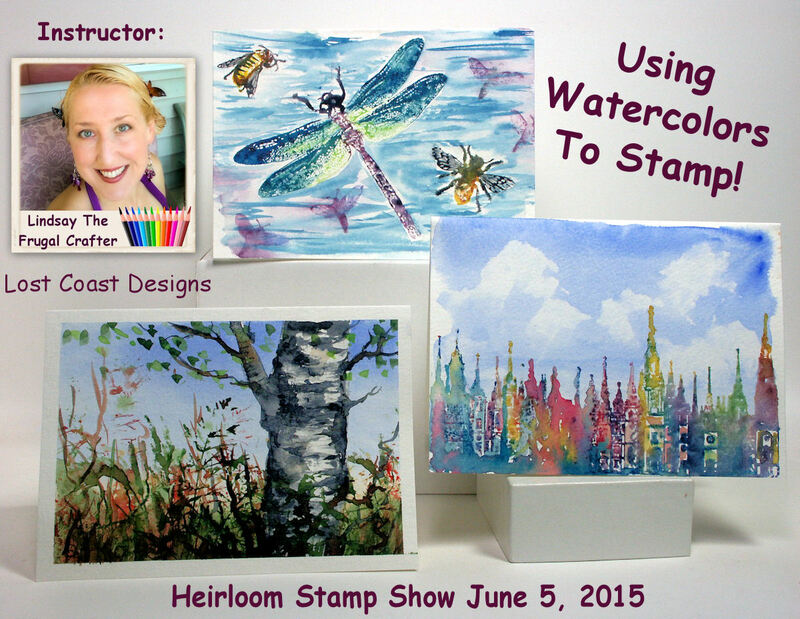 Firstly I will be teaching two watercolor classes at the Heirloom Productions Rubber Stamp Show and Paper Arts Festival on June 1st 2018 (yikes! That’s less than a month away!) You can sign up for them here. There are other fun classes running from 5/31-6/2 for card makers and paper crafters too and you can also rent a table to create while you are there. This year if you purchase a class in advance you get a free 2-day admission to the show. You can see the details on the Heirloom website. Here are my classes available this year! Don’t worry if you can’t make it to the show, these classes will also be in my next online course: Loose Watercolor Flowers. You can take both of my classes if you want (most students do) as there is no overlap in content. I try to design diverse classes so people can learn as much as they can! Loose Watercolor Bouquet: Lilacs (above) 6/1/2018 12:30-2:30pm *You will learn how to let the water do the work and end up with a gorgeous painting of lilacs in a mason jar. Finished painting size is 11″x14″ and the cost for this class is $50. Materials are provided for use in class but if you have a small spray bottle of water it would be helpful to bring it. Loose Watercolor Roses for Beginners (below) 6/1/18 3-5pm *you will learn the rose stroke technique and my “wet into spatter” techniques to help you loosen up and create 3 small paintings. We will start off with a rosebud bookmark to warm up and then paint a floral swag and wreath. You will learn techniques for front facing roses, side facing roses, rosebuds, foliage and filler flowers. The cost for this class is $50 and all materials are provided for use in class. All you need to bring is yourself and an open mind and willingness to learn! Space is limited to 20 students per class, visit the Heirloom productions website to sign up. Want to win a pass to the show? I have 6 tickets for admission to the Heirloom Productions Stamp Show in W. Springfield June 1st and 2nd 2018. If you are going to go (because I want to give tickets to people who can use them) please comment below “I’m definitely going to the show and I’d love a ticket!” I will pick 6 winners from people who say they can make it to the show. I will draw the winners in one week and reply to your comment if you won. The tickets I am giving away are admission to the show and do not include any classes. If you are purchasing a class you will receive a free 2 day admission to the show that is non transferable. If you bought a class but wanted to win a ticket for a friend that’s fine with me:) I will give the winner’s emails to the folks at Heirloom and they will email you tickets with whatever name you want printed on them. *You do not need to provide your email in the comment, I can see the email you used to comment with and that is where you will recive the prize. This stamp show is so fun to attend, I save my pennies so I can splurge a bit because it is so fun to see all of the new products and goodies and be inspired by all of the cards and crafts on display. If you have any questions regarding my classes you can leave them below and I will be happy to help you out, and if you want to win tickets just make sure to let me know you will attend the show so they don’t go to waste:) I think that’s about it! Oh and if you do go to the show and see me shopping please say “Howdy!” I’d love to meet you! I’ll be there both Friday and Saturday:) Thanks for stopping by and til next time happy crafting! Back from Vacation & World Watercolor Month! As usual I brought some art supplies for me and the kids. Most of it got used too! See what I brought in today’s video! Well, we did not run out of things to do! The kids got the most use out of the coloring books, they loved have the choice between pencils, pens and markers. I had no takers on the embroidery kits so I tried one and after a frustrating tangle on the first word of the design I went rogue and make some whimsical flowers and used the rest of the thread to make a friendship bracelet. Man, I forgot how much I loved making friendship bracelets, I spent summers making them as a kid! My kids did not see the appeal LOL. The following photos are some plein air sketches I did on the trip. I figured since July is world watercolor month it is appropriate to share! Here is the list of prompts for world watercolor month created by my friend Angela Fehr. Angela is also offering a free monthly watercolor challenge, and she has a fabulous prize giveaway worth over $500 of watercolor supplies! You can sign up here. You can find out more about World Watercolor Month on the Doodlewash website and join in on the challenge on their facebook page or by tagging #worldwatercolormonth on your favorite social media:) If you need a jumpstart on your watercolor journey consider checking out my Essential Tools and Technique for Watercolor painting course, it will get you started off on the right foot with 5+ hours of in-depth watercolor instruction for beginners to build your skills and confidence in the medium. I want to share one more painting from my vacation, it is a quick sketch of my daughter Lila I painted when she was coloring. Just a reminder you can sketch anything and everything and it will make you a better artist! Thanks for stopping by and til next time happy crafting! Hi friends! My husband attend one of my watercolor classes (for the first time and we have been together 16 years!) last week and see what he made. He painted the one with the green background. Isn’t that awesome? 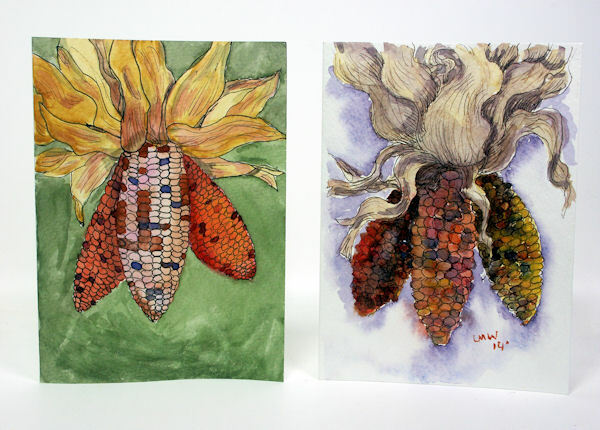 He thought trying the pen & Ink watercolor decorative corn project would be fun. I think he has a hidden talent! If he can try it so can you! Grab some waterproof pens and any watercolors and some watercolor paper (you can use cardstock in a pinch because this technique is very gentle on paper but watercolor paper is best) and let’s paint! I hope today’s post gave you the extra push to pick up a paintbrush, heck, maybe ask your partner to paint with you! It is lots of fun. Thanks for stopping by and til next time happy crafting!